The inhabitants of The District of Columbia were included under Maryland in the 1800 Census. Of the 5,308,483 people reported living in the United States, 893,602 were slaves. What was lost from the 1800 U.S. Census? Original records of the 1800 census from Georgia, Kentucky, New Jersey, Tennessee and Virginia were lost as well as records from Indiana, Mississippi and Northwest Territories. 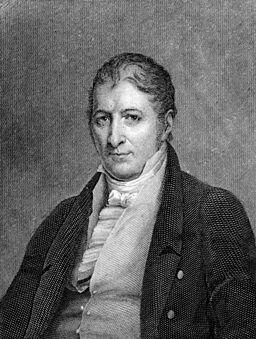 Eli Whitney is perhaps best known for his 1794 patent of the cotton gin, which revolutionized the tedious process of cleaning fiber from seeds of cotton. His invention was so successful it was often pirated and Whitney experienced years of court battles and licensing infringement over the invention. With the invention of the cotton gin (short for engine), cotton grew into the most important crop in the U.S. by the turn of the 19th century. Production of cotton grew astronomically in the coming decades, and was further aided by the growth of slave labor. By 1860, one third of the Southern population, or four million people, in the U.S. were enslaved. April 24, 1800: The Library of Congress is founded. November 16, 1801: The first edition of the New York Post is published. May 14, 1804: Lewis & Clark begin their expedition into the newly acquired Louisiana Territory.